Halloween parties are frequently all about the mood. In fact, in many cases the scarier, creepier or ickier the scene, the more successful the party. Adding body parts to a Halloween party is sure to create a spooky scene. The Nightmare Factory offers every limb imaginable. They even sell full-body props, such as the Jon Doe Autopsy figure. The Meat Market line of products features body parts, from hearts to hands, packaged on foam trays as if they were for sale from a cannibal butcher. Place Severed Finger Food, five severed fingers, next to the carrots and celery sticks on your veggie tray as a fun shock for the guests. HalloweenExpress.com sells a skinned head, cut off fingers and toes, and a bloody eyeball among many other macabre creations. If you like to browse the gory selection in person, visit party stores in September and October to take advantage of seasonal products. Halloween Costumes USA is one company that opens temporary stores in the months leading up to the holiday. Place skulls on the fireplace mantel or in the direct center of the dining room table. Nail a "severed" hand to a tree or door. Use as large and rusty a nail as possible to make sure it's seen. Drape an arm along the back of the sofa where a guest may sit down. Hang a dead body from the shower curtain. For the best effect, light this from behind and pull the curtain across to produce a silhouette. Plant a few limbs outside in the garden in front of some headstones to give the impression that the dead are rising from their graves. Include a few severed fingers on the tray with the cut vegetables. Insert a foot and ankle into a shoe and place it with the other shoes near the door. Don't be afraid to get creative and place a few limbs wherever you think your guests may wander. You don't have to spend a lot of money to decorate with body parts at a Halloween party. Instead, make your own. 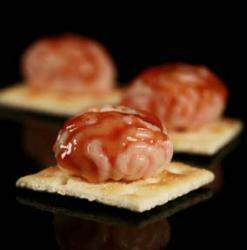 Make mini edible brains using molds! If you'd like to add some horror to the buffet table, consider body part gelatin molds. Amazon sells brain and heart molds. 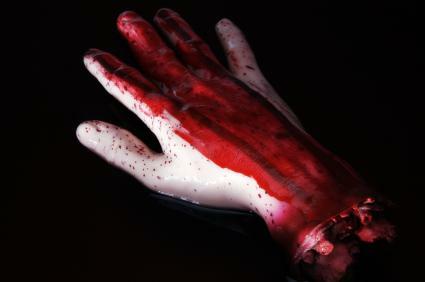 Fake hands are truly multi-purpose body parts, and latex gloves provide a quick and easy way to create them. Fill a glove with water, tie off the end and freeze. Peel away the glove, and enjoy a floating hand in the punch bowl. Use a glove as a mold, and fill it with plaster of Paris. Paint your plaster hands and leave them in unexpected places around the party room. If you like your fake body parts to be a little less stiff, experiment with fillings, such as sand or pudding, for stuffing the latex glove to give it weight and texture while remaining flexible. You may want to start by telling a ghost story, and then introduce each bowl in relation to the story, such as, "Here are the eyeballs that failed to see danger coming" or "And now in his coffin, only the worms remain." Many body parts sold at costume shops and party supply stores are highly realistic and are not for the squeamish. Keep in mind that not everyone will enjoy being greeted by a severed head or bloody intestines. If you're unsure, choose cute or campy over gross. Parents should especially use caution before using body parts at a Halloween party for kids. In addition, never make guests participate in activities that make them uncomfortable. If someone doesn't want to stick his hand in a bowl full of "eyeballs" or your daughter won't eat a jiggly slice of "brain," don't force the issue. Fake body parts should be a source of fun thrills, not true fear and disgust. Many people expect to be frightened at Halloween parties. Do your best to live up to your guests expectations with some body parts, severed limbs or skulls placed strategically around the house and give your guests a night they are unlikely to forget.